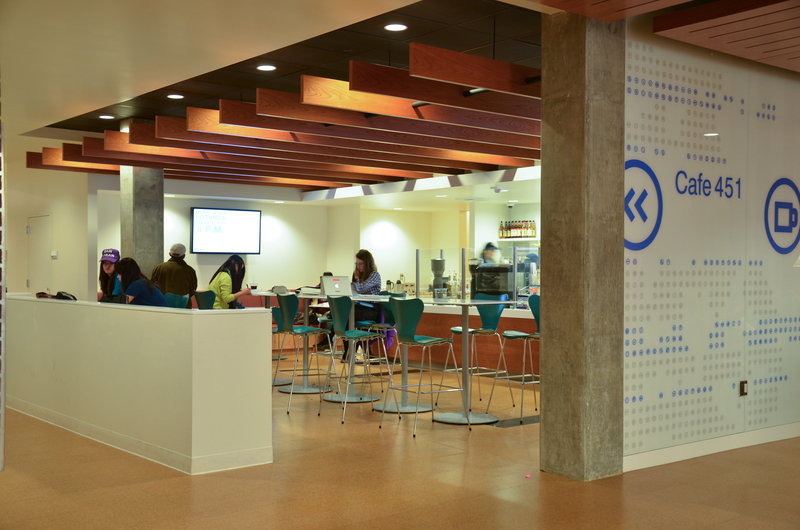 Located next to the Research Commons, Café 451 proudly serves Intelligentsia coffee and other beverages, as well as snacks. The café is named in honor of Ray Bradbury's famous novel Fahrenheit 451, written in UCLA's Powell Library. Intelligentsia introduced the concept of Direct Trade practices to the coffee industry. They meticulously collect data, insights, and best practices from all of their growing partners to improve overall quaity. They also tie adherence to sustainable farming and environmental practices with their commitment to paying above Fair Trade prices. This ensures responsible stewardship of the land, and a sustainable business model for their farmers, resulting in partnerships that thrive year afrer year. Because of this, Intelligentsia provides exclusive, remarkable coffees.